One of my earliest memories involves ice cream, and was a drama in 3 very short acts. The first act began with someone (probably my dad) purchasing a cone for me, and featured the delicious cold sweetness making its way to my mouth. The second act — the crisis — was when we were leaving the shop: The ice cream fell off the cone and landed on the floor. The magnitude of that misfortune was so great, I couldn’t even cry — I just stared at what I had suddenly lost. The third act was a happy ending. The store owner gave me another ice cream cone, free of charge. It is only a slight exaggeration to say that I have savored every bite of ice cream that I’ve had since. Apparently I’m not alone in my fondness for it. It may not be literally true that we all scream for ice cream, but according to the International Dairy Foods Association, “more than 90 percent of American households purchase ice cream.” The total annual production of “frozen dairy” in the U.S. is more than 1.6 billion gallons. We may need to eat it right out of the carton just to keep up with all that production. The origins of our beloved dessert aren’t clear. There are legends that date it to the 2nd century B.C., but there isn’t any factual evidence to support stories like the one about Marco Polo bringing it back from China, or King Charles I of England having a secret recipe for ice cream. The IDFA states that the first advertisement for ice cream in the U.S. appeared in the New York Daily Gazette in the 1770s. Until the 19th century, though, there was this limitation on the mass production of ice cream: How do you keep it cold? A guy who found solutions to that basic problem was a Baltimore milk dealer named Jacob Fussell, who was a pioneer of the ice cream-manufacturing industry in the 1850s. At first he used mountains of ice, but over the next couple of decades mechanical refrigeration was developed. Meanwhile, chefs were experimenting with all sorts of flavors for ice cream. In her book Chocolate, Strawberry, and Vanilla: A History of American Ice Cream, author Anne Cooper Funderburg says that by the 1870s, the famous New York restaurant Delmonico’s offered an assortment that went way beyond the basics. Oh, they had chocolate and vanilla, but they also had ice cream flavors like asparagus and pumpernickel rye bread. Yes, “blecch” was my reaction when I saw that, too. So what is the most popular flavor of ice cream? I was surprised to learn that it’s vanilla, according to the IDFA’s consumption figures. Even though vanilla is almost a synonym for bland, it topped their list at 27.8%, followed by chocolate at 14.3%. Rounding out the top five are strawberry (3.3%), chocolate chip (3.3%) and butter pecan (2.8%). This entry was posted in Dining and tagged ice cream. Bookmark the permalink. As a youngster, strawberry was my favorite, but now I tend to be somewhat fickle. Right now pistachio is in the number one spot. Asparagus? Who’d a thunk? Spinach, sure, but asparagus? Remember when the parents used to say, “eat all your dessert or you can’t have any spinach ice cream”? I’m w/Sally on the IC ballot, jamoca almond fudge is superb. Haven’t had any flavor of ice cream in over a year, I’ll bet. Maybe today is the day for a trip to BR or DQ. You are to be congratulated for abstaining from ice cream for over a year, Gerry. I admire your will power, and if you feel yourself weakening, just think about a couple of scoops of lasagna ice cream. It probably took some courage for you to try Black Sesame the very first time, because it isn’t visually appealing the way some other flavors are. From pictures I’ve seen, it sort of looks like it’s made from ashes, but if you were having it for lunch, it must be good! Thanks for your comment, Zung — I’m with you on hazelnut. I became a fan of gelato on a recent trip to Italy. My former love of mocha chip ice cream paled once I went to Sorbetteria Castiglione, which supposedly has the best gelato in Bologna. I tried something called the Cremino Guglielmo, which is espresso with marscapone and chocolate chips. Molto bene! That sounds incredibly rich — sort of an intense version of mocha chip. “And did you want that with cheese?” “Why, yes I do!” Thanks for the comment, Jen; I was pretty sure you’d have an opinion about ice cream. It is not healthy to eat as much ice cream, better drink lots of water and healthy balanced meal. My fave flavor of ice cream is Wild ‘n’ Reckless. That one was new to me, Frank, so I looked it up online. It’s a mix of green apple, raspberry and fruit punch sherbets, concocted by Baskin-Robbins. 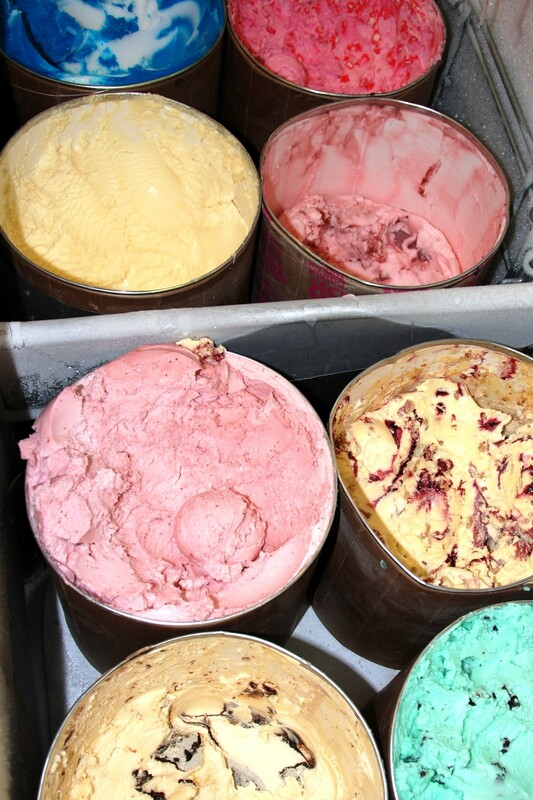 That got me wondering how many recipes Baskin-Robbins has in their vault — I’ll bet it’s far more than 31 flavors.